Delaware Transportation Secretary Jennifer Cohan and Delaware Transit Corporation (DTC) CEO John Sisson were joined by State Tourism Director Elizabeth Keller and other state and local officials to celebrate the start of construction on the Maintenance Facility at Lewes Transit Center along DE 1, just south of Five Points. The three-bay maintenance facility is designed for alternative-fueled vehicles which are cleaner for the environment, including propane for DART's paratransit fleet and eventually electric buses for the regular bus service, is slated for completion next summer. 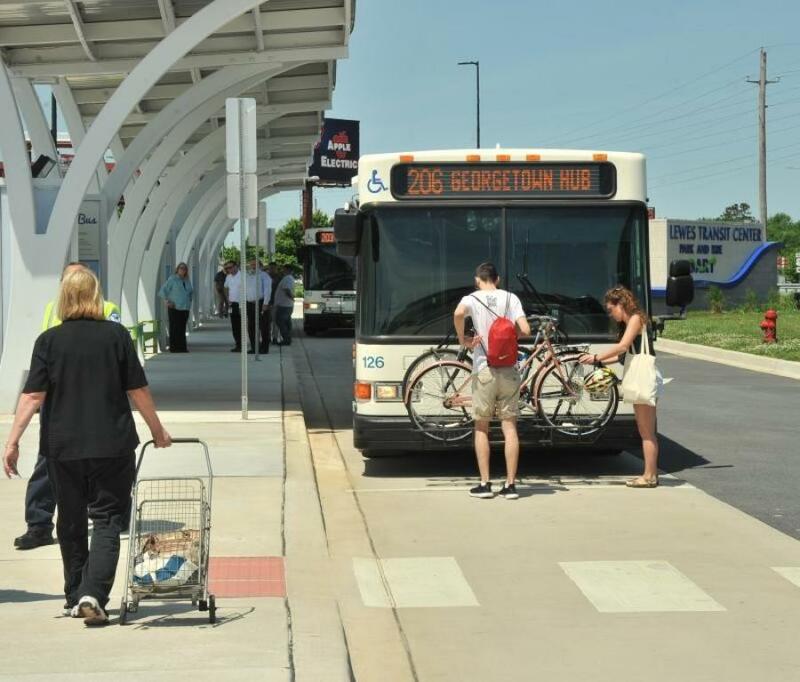 Last May, the Park & Ride at the Lewes Transit Center opened with 248 parking spaces, security cameras, passenger shelters, electric car charging stations, bike racks and repair station. “The northern location of this transit center is ideal as it offers travelers an option before getting into the heaviest beach traffic. With free parking and frequent bus departures, passengers have a convenient way to get around, and with the dedicated bus lane, you can get to the beach faster than by car,” said Sisson. May 21 kicks off the summer tourism season with the startup of DART's daily Beach Bus service. Local buses operate frequently from early morning to late night serving Lewes, Rehoboth Boardwalk, Outlets, Long Neck, Millsboro, Georgetown, Dewey, Bethany, Fenwick Island and Ocean City, Md. It also marks the inaugural run of the new Intercounty Route 307, providing weekday express service between Lewes, Milford and Dover, with connections at the Dover Transit Center to Christiana Mall and Wilmington Train Station. Route 305 Beach Connection provides seasonal weekend service from Wilmington, Christiana Mall, Middletown, Dover, Lewes and Rehoboth through Labor Day. After the Beach Bus service ends on Sept. 9, all Sussex County bus routes will be expanded to include Saturday service, and the two most popular Beach Bus routes (201 - ; Rehoboth and 204 - ; Lewes) will continue year round operating every 30 minutes from 7 a.m. to 11 p.m., Monday through Saturday. “This new facility, along with other improvements at the Lewes Transit Center, are helping to enhance the experience for visitors to Delaware using DART,” said Liz Keller, Delaware Tourism director. “Travelers, who are contributing to the industry's $3.3 billion impact on the state, will not only be taking advantage of the new transit services during the prime season but will also enjoy the services into the shoulder- and off-seasons that are so important to the area's tourism businesses." Enhancements at Lewes Transit Center this year include a new Visitor Center to be completed later this summer, providing an air-conditioned passenger waiting area, tourist information, ticket sales and public restrooms. Under the new large canopy, shelters accommodate LCD screens to display real-time bus information, and offer cell phone charging availability. And soon, customers will be able to purchase DART passes on their phones with the launch of mobile fare payment. For more information, call 800/652-DART or visit DartFirstState.com.